I love Twice Baked Potatoes. Growing up, they were something my brother and I would always agree on. Whenever my mom would make them, she would be sure to make lots of extra. That way, we could come home and munch down on one of our favorite after school treats. They make the best leftovers. And as an adult, I still think they are just one of the best things ever. I mean really. What is not to like? 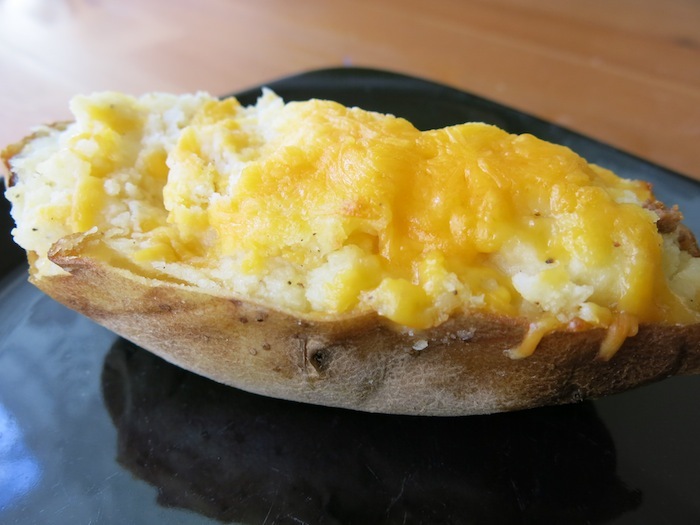 It is a baked potato with all the wonderful smoothness and flavor of mashed potatoes. Silky, gooey, and oh so delicious. Not the best thing in the world for you perhaps, but something that is an ultimate comfort food and a sure to please side dish. I used to use the excuse that they were too much trouble to make very often. In reality, they aren’t that much trouble. I think that deep down I just know that if I make the all the time, I’ll eat a million. It also doesn’t help that when it comes to cooking, I tend to be of the mindset that if you are going to do it, you might as well do it and toss in that extra spoonful of sour cream. One of the best things, or worst depending on how you look at it, about these gems, is that they freeze really well. You can make a huge batch and before the second bake, toss a half dozen in the freezer for another time. When you want them, just toss them in the oven until warmed through. This can make for a very dangerous freezer. Well, you’ve been warned. 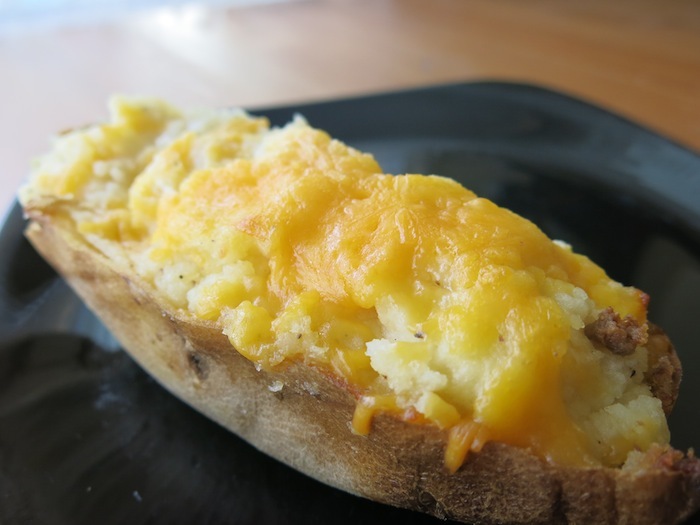 Twice baked potatoes have the potential to become a food addiction. Once you start, you might have a hard time getting enough. And hey, they go really well with meatloaf. Cut a slit in the top of the potatoes and roast for one hour at 350 degrees, until easily pierced with a fork. When the potatoes are done, cut in half and scoop insides into a large bowl, leaving the skins in tact. Leave about 1/4 inch of potato inside of the potato skin, for stability. 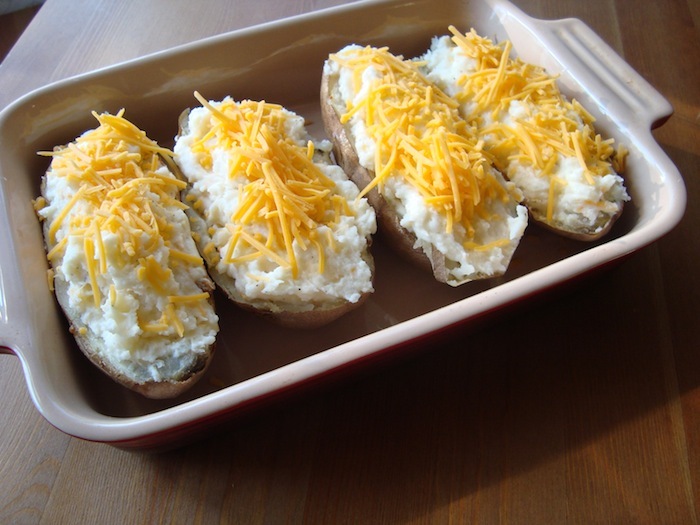 Set the potato skins aside in an oven safe dish. 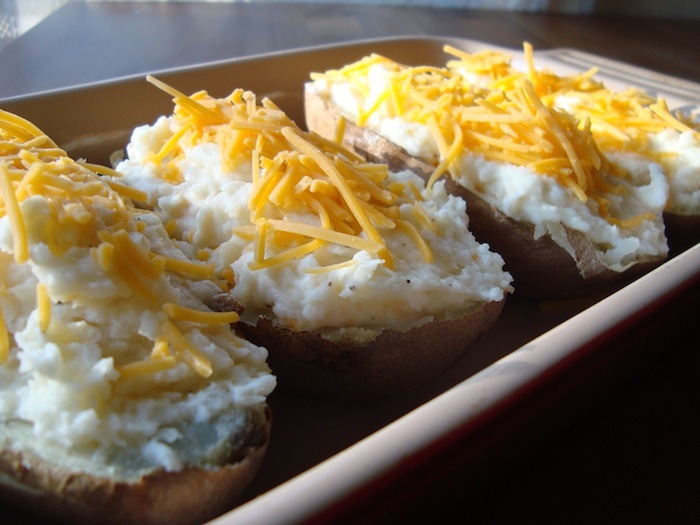 In the large bowl, mix the potato with the butter, sour cream, salt, pepper, and 1/4 cup of shredded cheese. Smash the ingredients together until reaches a fairly smooth consistency. I like small chunks remaining, but it is up to your preference. Taste and adjust seasoning if needed. Fill the empty potato halves with the filling you just made. Top with remaining cheese. Bake at 350 for 20 minutes, or until cheese is melty. Also, if you want to freeze twice baked potatoes, do so before the final baking. When you are ready to eat them, just put in oven frozen until reheated.